On some designs a broken belt will cause it not to start. Did we check for 240 volts? 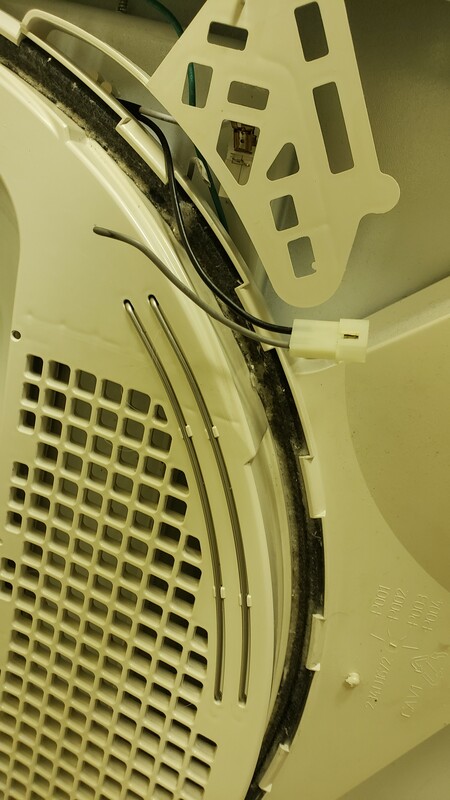 So before I go further, I took the front off the dryer and noticed this gray wire has been torn away. I can't find a diagram to tell me what it does. Connects to a harness with a red and gray wire. But makes sense to start with the obvious before I start taking it further apart. FWIW - already tested the continuity on the door switch, the thermal fuse, and the start switch. All good. Next was going to be the interlock switch. But didn't want to tear into it until I got some info on this broken wire first. Sorry for multiple parts - can't figure out how to edit my own posts on mobile at least. What are the 2 metal bars on the inside of the door? I was guessing something to do with a temperature sensor? That seems to be what the broken gray wire is connected to. Watched a video and determined they are "moisture sensor" wires. Would a break in one of those wires cause the dryer to not start? unplug the dryer and check for continuity from the red wire at the terminal block (where the cord is connected) to the red wire at the timer. if this is open, i would check the fuse by the terminal block or a broken wire. Then from the red wire at the terminal block to the brown wire at the timer . the timer will need to be in the run position while you are doing these checks . if that is open, i would suspect the timer. Next go from the red wire at the terminal block to the brown wire on either side of the thermal fuse. If that circuit is okay, i would go from the m4 terminal at the motor to the white wire at the terminal block. if that is open look at the door switch and wiring. If all that is okay, I would jump out the idler spring switch and see if that solves the problem. Make sure the idler arm is contacting the switch. Sometimes after moving, gets out of position.